In all the strip-quilt pattern books you’ve seen, we bet you’ve never seen one packed with this much sewing fun—ladies (and gents), it’s time to get stripping! Gather your stockpiles of strips for the 13th book in our “Big Book” series: The Big Book of Strip Quilts! For scrappy strips, stash strips, and the Jelly Rolls on your shelves comes a whopping 60 patterns from some of today’s brightest designers. 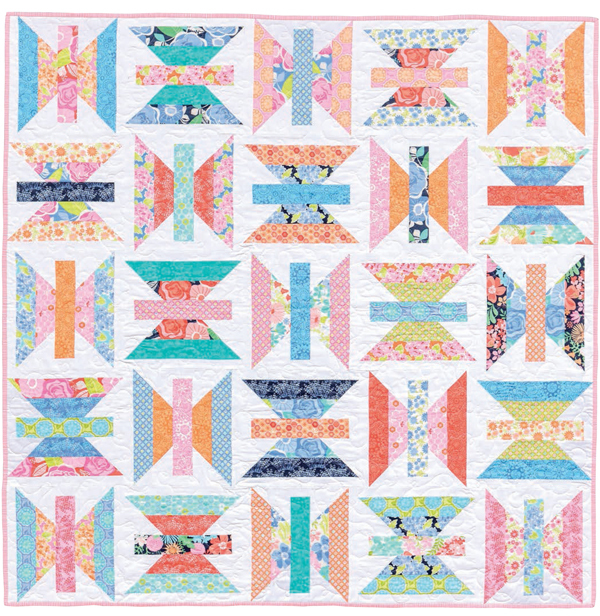 Enjoy patterns for stunning strip quilts from Kim Brackett, Kathy Brown, Amy Ellis, Melissa Corry, Kate Henderson, Rebecca Silbaugh, Sue Pfau, Julie Herman, Gerri Robinson and more—all for just pennies per pattern. 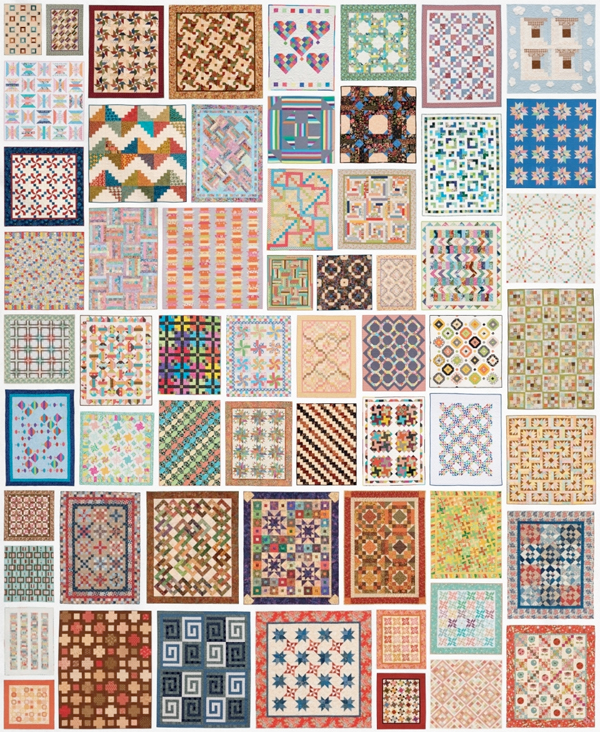 All 60 quilts from The Big Book of Strip Quilts, packed into a single shot! 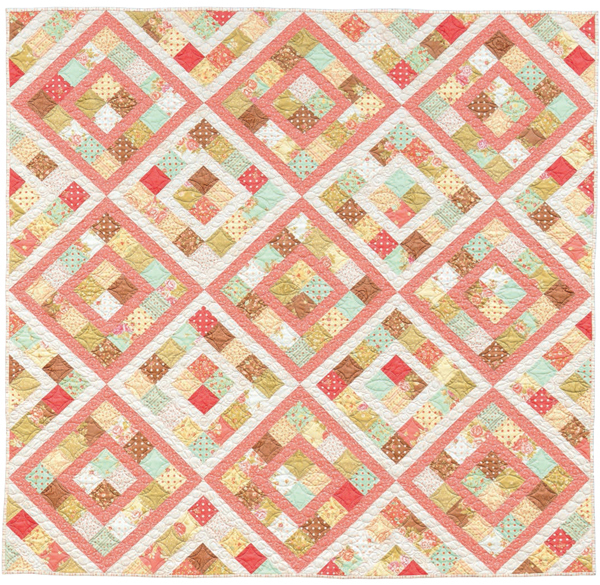 Boxed In by Julie Herman—picnic quilt, anyone? Fat Man’s Squeeze by Kathy Brown—just comfy, cozy goodness! That’s six gorgeous quilts from the book: but there are still 54 more to choose from! So many designers, so many strips—sew much fun. So, what kind of strips do you own right now? I’m off to start stripping my stash! Tell us your answer in the comments and you could win an eBook copy of The Big Book of Strip Quilts! We’ll choose a random winner one week from today and let you know by email if you win. Good luck! And remember, when you purchase the book at ShopMartingale.com, you’ll be able to instantly download the eBook for free. We’ll email you about your prize, Marie—congratulations! I have stacks of jelly rolls! I am off to start stripping my stash! Lol! Sounds great! stacks of jelly rolls AND scrappy strips! I have boxes of scrap strips just waiting for this book! I have a few jelly rolls, and a large stash that I can start stripping!! I have boxes and boxes of cut strips. They are waiting for the right pattern! I have a few jelly rolls but I usually cut strips from my stash. I have stacks of jelly rolls and yards of fabric waiting on beautiful patterns to be finished! 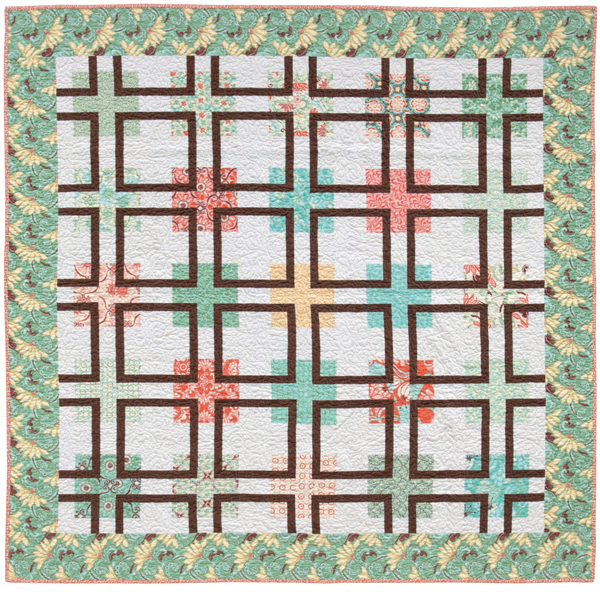 Scads of strips…just love scrap quilts and string piecing. I’m addicted to jelly rolls! I have stacks of jelly rolls AND scads of scrappy strips! I have scads of scraps ready to be stripped….. and few jelly rolls, too. Have some jelly rolls, but of late have started to strip leftovers from completed projects to cut down on my growing stash. Love the patterns in this book. Jelly rolls from "got to have it" collections us strips leftover from other projects…..I need this book to help clear my stash! I have scads of scrappy strips from other projects. I actually have a huge drawer full of strips. I own exactly one jelly roll of batiks that was precut. Well, I just bought the "stripology" ruler and have a few years of uncut fabric that is crying to be cut. I have already started the cutting, but could really put this book to good use. I have scads of strippy bits and am in the mood for a terrific scrappy quilt! I have a scrap bucket of jelly roll strips that I love to use for scrappy projects. The strips and scraps NEVER go to waste! I will have to start "stripping my stash"!! Looks like a wonderful collection of patterns! I have a couple jelly rolls, but mostly I have scads of stash to strip! I have an entire dresser drawer filled with jelly rolls! They are so cute and I just can’t resist them! I love using them as I can just start sewing! I have tons of scraps, mostly stripped in 2 1/2″ strips! This book would be ideal for me! I have 1 lone stack as I prefer yardage. The book looks great and maybe could tempt me to change my fabric purchasing! Since I collect scraps and I love playing with strips I have loads of scrap strips with just a few jelly rolls that I’ve purchased. My favourites are bargello done with scraps! I have tons of scraps just waiting to be stripped. This book is absolutely on my wish list. The only hard part is going to be deciding which to do first. Scads of Scrappy strips. So much left. Lol. I’d love ideas on how to use them up. I have some left over Jelly rolls and lots of scrap that can be made into strips. That would be a good way to use up stash! Scads & SCADS of scrappy strips. The perfect book to start tackling those! I have lots of jelly rolls that need to be made into something. This book should help me figure out what. I have about 15 jelly rolls and have started building my stash with cut 2-1/4 strips and 1-1/2 strips. I have one jelly roll that I bought several years ago and just am not ready to start cutting it. Maybe now! I have scads of precut 2 1/2″ strips. This book is what I need to inspire me to use them up!! I have so much stash that could be put to good use with all the fantastic quilts. Sure could use this book! My stash needs stripping STAT! I have a couple jelly rolls and a small stash of strips. A couple of years ago, I sewed up a big stash of strips and since then I have kept a smaller stash of strips, but I have lots of stash to cut strips from if I need to. Boxes and boxes of strips cut from quilt leftovers! I have made two quilts using precut jelly rolls and loved them both. Good luck to everyone!! Have never used jelly rolls but would love to start! I’ve got scads of scrappy strips: scraps from other projects of course. I have some jelly rolls and lots of strips. I love using them together. I love the pictured butterfly quilt and am already planning it in my head! I have lots of scrappy strips sorted by width love playing wiht them. Awhile back I took all of my scraps and turning them into 2 1/2″ and 1 1/2″ strips. This would be a great book to turn those strips into a quilt or two! scrappy strips, mostly, with a couple jelly rolls. I have several bankers boxes full of jelly rolls. I have Stacks of Jelly Rolls. This book looks like it would give me lots of great ideas to put them to good use. I have a lot of jelly rolls and a lot of scraps. I am a material must have person who loves cottons. My husband had to take one of our walk in closets and turn it into a place to store my materials only. I am always looking for new ideas to make quilts. I love to quilt. In my quilt room there is a sign that says Warning quilt Pox. I am retired now and quilt everyday. Love it What a way to retire. My friends who quilt know where to come to find books or material they may need to finish a project or just for advice they like it all cause its free cause I feel everyone needs to have a hobby of some sort to keep them busy especially when they retire. I love it. I have a few jelly rolls and lots of scrappy strips. Stacks of jelly rolls! They look so pretty stacked up and I’m nervous to take them apart and use them–lol! I have some prepackaged jelly rolls I couldn’t pass up from quilt shows waiting to be used! I have stacks of jelly rolls and scads of scrappy strips. This looks like just the book I need. Thanks for the giveaway. I have a couple of Jelly Rolls that are begging to be used, and then arb strip scraps. By the looks of this book I am going to have to get strip cutting. I can see at least 5 that I absolutely have to need to want to make! SCADS of scrappy strips, just waiting for the right pattern. I have absolutely SCADS of scrappy strips! They’re leftover binding strips from a group I belong to which makes comfort quilts for sick or disadvantaged children. This looks like a fabulous book — thanks for the chance to win! Scads of scrappy strips! Would love to use them on some of these great patterns! Off to start stripping my stash! I’ve been cutting strips from my stash for twenty years, waiting for the "right" projects. So I have scads and scads. This book would be just the thing for me to use up lots of those. Looks like a wonderful book to use up all my 2 1/2″strips. How did I get so many??? I’m off to start cutting 2 1/2″ strips from my scraps. I really liked the "Spinners" quilt! I’ve got scads of jelly rolls and scrappy strips. This book is just what I need! I have a lot of scrappy strips that I would love to use up. This book would definitely give me some great ideas! I have containers and containers of scrappy strips. I really think they multiply when I am not in my sewing room. Lovely book. I try to cut the remaining fabric after a project down to strips and store by colour, mostly I have 2.5″ strips, I am finding i really l like variety of colour in my quilts,however I still like to control colour placement. I am always on the hunt for patterns and this book looks like a winner. I never buy jelly rolls but have yardage that I would love to cut up and use more, so I guess now would be a good time to start stripping my stash. I have scads of scrappy strips and this would truly inspire me to use them! A few jelly rolls but mostly yardage. I LOVE jelly rolls! I have charm packs and layer cakes too! I have stacks of jelly rolls, and of course scads of scraps. I own a few jelly rolls. I would love to win this book! Scads of strips. Putting them together today to start a quilt. Would be fun to have some new ideas. I have lots of jelly rolls and strip packs that I have purchased; they’re just so darn pretty that it’s hard to resist them, even when I have no idea how I am going to use them! I’ve also started a bin for 2 1/2″ strips that I have cut from leftover yardage pieces. I have a couple of jelly rolls but I think I need to start stripping my stash. I have several jelly rolls and also many scrappy strips. I cut a few off left over yardage and then make my own jelly rolls , on top of the ones I can’t resist in the store. Hi! What a beautiful book; I’m of to start stripping my stash, so, I sure Hope I win this book! Thanks for the opportunity! I currently have scrappy strips. While I would love to buy jelly rolls they are not in my budget. Scads of scrappy strips just waiting to become quilts. As I think all quilters do I have a few jelly rolls and lots of scraps. The book looks great. I have a few scrappy strips left from other projects but most of my stash is not in strips. Every time that I buy fabric I purchase an extra quarter yard and will use that extra to make pre-cuts like strips and 5 and 10 inch squares. This way when I am between special projects I can go to my stash and make something fun and scrappy. i have jelly rolls and stacks of scrappy quilts. this book looks amazing. I’m just now off to start stripping my stash! OMG! Now I’ll know what to do with all of those jelly rolls I have collected through the years!! I have scads of scrappy strips all neatly stored and ready to use! Many jelly rolls and uncounted stray batik strips – this will definitely be a book to add to my collection!! I have boxes of cut strips and even more of unopened jelly rolls. Hate opening them! Please choose me to receive this book because I need to get stripping! All the new techniques and patterns you show me shall be well used. I promise. Please, please! Save me from my hoarding and help me convert to finished quilts. I have both jelly rolls and lots of 2.5 inch scrap strips. Love to make something useful with them! I love jelly roll quilts, mainly because the different colors and patterns are already chosen for me. I don’t have to spend hours in our small fabric store trying to match colors and patterns from several different fabric manufacturers. there’s a short stack lurking in my studio just waiting for the book! I have only used strips once and it made the whole process so much easier. I have mainly yardage or yardage scraps in my stash. I really need to add some strips. I own jelly rolls from Moda and Tonga, and Timeless Treasures. I love them all. I have jelly rolls and stripes I cut myself. I love buying jelly rolls and this book would help me turn them into beautiful quilts! Ok, no laughing. I have 54 unopened jelly rolls. They are decorating two shelves in my sewing room. Does anyone else collect jelly rolls? I have a stack of 3 jelly rolls and scads of scrappy strips. I’ve been waiting for just the right pattern to come along. It is in this book! I have a few of my scraps stripped, but have a long way to go; so I guess I am off to start stripping. I love Jelly Rolls and would love to own this book. I have lots of stash that could be turned in jelly rolls. This book would be a big help! I have scads of scrap strips. I only own a couple of jellyrolls! I have lots of scrappy strips, this book would help eliminate some of them!! I have stacks and stacks of jelly rolls! And tons of yardage…. I have some jelly rolls and am thinking about making some of my own. The book looks great. Love Kim’s Island Chain pattern. I have most jelly roils and I keep coming back to this pattern. Simple and quick. Just finished using TT Sunburst and Punch using Kona Cotton black. Wish I could have posted a photo. It came out stunning! I have a couple of jelly rolls but tons of stash ready to be cut into strips. This book is just what I need to get going. Thank you for the wonderful giveaway! I have lots of jellyrolls and a multitude of strips cut from my fabric stash!! I love all of the patterns in the book. Great inspiration for using all of the strips I’ve collected. I have a mixture of jelly rolls, scraps and leftover yardage from various projects. Cutting strips – what a great idea! I have been making my own strips for a number of years now… when you have lots of yardage, your can make lots of strips…. oh what fun to see how the same colours come together in different ways just by changing the blocks! Love the jelly rolls, so interesting how strips turn out when sewn together! I have all of the above and am always looking for new ways to use my favorites. I have loads of strips. Most are orphans from jelly rolls though. Half a dozenish jelly rolls at this point. Would love to have this book to play with! I have scads of scrappy strips. I need to start stripping my stash! I have far too many stacks of Jelly Rolls! But don’t tell my husband! Can someone please tell me how to find the time to sew them into quilts? For some reason there are far too few hours in my day! I have been cutting strips from project leftovers. This could help me DO something with them! I have stacks of strips but no patterns in mind for them so this book would definitely get me to using my strip collection!!! Thanks for the opportunity to WIN!! I have jelly rolls and lots of scraps. There are several quilts in the book that Iwould like to make! I own "scads of scrappy strips" I really need something to do with them all. They just keep growing. LOL This book sounds perfect. Thanks for a chance. I really must start to "strp my stash"! I have lots of fabric to use and would love to win the book. I own scads of scrappy strips. Looking for ways to use them all. Looks like I’ll be getting out my ruler and a new blade to cut some strips. Can’t wait to peek at this book. I have scads of scrappy strips, with 3 or 4 jelly rolls waiting for my attention. So many ideas, so little time! I have a couple jelly rolls, and some charms. The rest is fabric. I don’t like to cut the fabric until I know what size I need. I am afraid the "perfect" fabric for the quilt would be cut the wrong size. Beautiful Quilts! I’m off to start stripping my stash! I have a pile of scrappy strippy strips and a few partial jelly rolls. Book looks interesting. Would love to have this book as I have several jelly rolls as well as many scraps which could be cut into strips! Matter of fact I am working on a grad gift now from a Jelly roll. I am making a quilt from my jelly rolls now. I have lots of scrapes as well. I could really use this book. I have purchased some pre-cut Jelly-rolls, but also manage my scraps by cutting them into 2 1/2 strips and other common commercial pre-cut sizes, just waiting for the right inspiration to come along. This book looks promising! I have jelly rolls and also a gajillion potential strips in my yardage. I have stacks of Jelly Rolls just waiting to be unleashed. I love your Big Book series. I have stacks (and stacks) of Jelly Rolls and I cut my scraps into strips, too. So this book will be coming home to me. I have lots of jelly rolls. Oh, how I need to use them! This book would be terrific! I have scrappy strips. Try to cut any leftovers into strips right away. Not that it gets done! What a wonderful book. I have scads of scrappy strips, this book would be great!! Well, I do have a number of jelly rolls just waiting for the right project AND I have a lot of my stash-cut strips, some of which are labeled by size & are in plastic, see-thru containers. So, bottom line, I could really use this book! (And some extra hours in the day to use up all the precut strips I own!) Great giveaway, again. Sure wish I’d win one. Stacks of strips, as well as stripping my own (when I find something to match strips I already have). I have a small stack of jelly rolls that would be perfect for this book. I have stacks of jelly rolls and quite a stack of scraps. Thank s for the giveaway. The book looks wonderful. Most of the Jelly Roll straps in my stash are left from other projects, either too many or not the correct color/pattern for what I was working on at that time. They are waiting for a pattern to shine in! This book looks very versatile and will make a great stash buster!! Thanks for the opportunity to win a copy. I have stacks of jelly rolls. Would love to win and make the butterfly quilt. I am a combination of having stacks of Jelly Rolls AND scads of scrappy strips! I have both many jelly rolls, and scads of strips as I have a go cutter! I could really use this book. One day I stripped all of my solid batiks, and now have a box full just waiting for an inspired moment. Looks like this book fits the bill. I have lots of jelly rolls and oodles of scraps as well as a pretty good stash to start stripping! I have both. My jelly rolls are in waiting for just the right quilt. 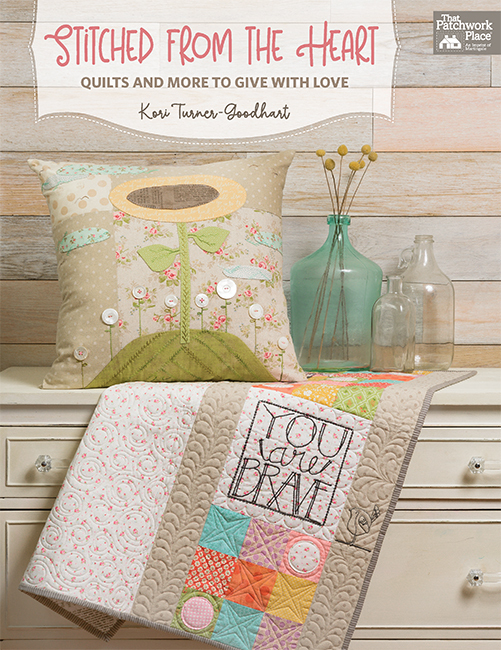 I loved the 6 quilts you highlighted from this amazing book. I had better get busy and start stripping my stash!! I have a couple jelly rolls but I have lot’s of 2-1/2″ scrap strips. Whenever I have just a little bit of fabric left I cut it into 2-1/2″ strips and put it away. I really need to do something with those strips! This book would be perfect! I’m ready to start cutting–the quilts in the book are awesome! I have about 4 jelly rolls, never bought more because there were not many patterns available that I liked, now there are! Have just a couple of rolls & have been waiting for inspiration to use them! I have scads and scads of scrappy strips and bits. A few years ago I learned the "clean up your scraps" trick that has you cut them into useable bits. I did that (need to do it again), and have an entire bin of miscellaneous lengths, all 2.5″ wide!! I definitely have scads of scrappy strips, just waiting to be turned into something wonderful! I’m off to strip my stash! Would love to win this book! I have a stack of jelly rolls! LOL! I’ve got both jelly rolls and scrappy strips. So many great designs ~ I love the possibilities. Thanks! I have jelly rolls and some scraps of fabric….which I’m now going to make into strips! Thanks! I have scraps from my first full quilt that I finished last month. I also have a jelly roll topper that needs to be quilted! So I have a used jelly roll and several bags of scraps! Oh my gosh! This book was created with me in mind. Wow! The ideas…which one to choose? But not just one! I would treasure a copy of this book. I have oodles of scraps and a growing pile of jelly rolls. Would love to put them all to good use by making some of these beautiful and fun quilts! I have Jelly Rolls – and what am I supposed to do with them? — and then I have lots of strips left over from other projects. This book would be a help in using up all I’ve collected. I love jelly rolls. I have several collections so I am always looking for ideas to use them in quilts. Tons of scrappy strips. thanks for the chance. I have scads of strips and I would love to have this book! This would be the book of all books in my library! Thank you! I have tons of jelly rolls! I have one jelly roll just waiting for the perfect pattern! This book would help with that! I have some scrappy strips. My stash includes a small stack of jelly rolls, and overflowing scraps at the moment! I have scrap strips from two finished quilts and now scraps from a jelly roll quilt kit I am working on now. I will have to strip my stash! While I have a few jelly rolls, I have a lot more scrappy stripes. Theses are beautiful quilts and would be fun to make. I have stacks of jelly rolls, and several boxes of scrappy 2 1/2″ strips all waiting for the perfect pattern. Looks like a great book to have. Las pilas de Jelly Rolls están en mi escondite. Compré una oferta y no se que hacer con ellas. Me vendría fenomenal este maravilloso libro. Saludos. Translation: Jelly Rolls are in my hiding place. I bought an offer and not be what to do with them. I would be phenomenal this wonderful book. Best regards. Many jelly rolls, lots of scrappy stripes just waiting to be made into something wonderful! Just starting my jelly roll stash! You have such great giveaways. Thank you! I have a large collection of strips waiting for inspiration. I started stripping my ’30’s prints and some of my stash. This book would help me put a dent in my stash. OMG! I NEED this book!!! I can’t tell you how many jelly rolls or 2 1/2″ strips cut I have. Great big book idea. I have a drawer full of jelly rolls and a bin full of scrappy strips that are all ready 2 1/2″. This books looks like it would be really fun to start using both stashes. I have absolutely zero jelly rools. The book looks like it has many fun patterns. I have jelly rolls, layer cakes, and yardage. This looks like the book for me! While I have some 2 1/2 inch strips, most of my fabric is in stash form. I’ve made one strip baby quilt and loved it. Cannot wait to do another. I have several jelly rolls – they are so hard to resist! Stacks of Jelly Rolls. I seem to purchase them and let them set. I am waiting for inspiration I guess. This book definitely looks inspirational. Jelly rolls and honey buns seem to just appear in my stash. Plus many strips from projects I’ve made. This book would really come in handy. Thanks for the chance to win. I have rolls, flat folds and strips from exchanges. Would love to use some of them up making quilts from this book. Though I may have to get some more red, white and blue fabric to make Porch Swing….. I have stacks of jelly rolls and scads of scrappy strips. I could REALLY use this book! Thanks for the give away and for introducing me to this book. Lots of jelly rolls that need to be made into quilts! As hard as it was, I gave away my neatl scrap stash before moving so I would have less weight to move, so, off to start my stripping stash! I have tubs of precut strips made of all my scraps. – I need this book! I have stavks of jelly rolls and scraps that desperatley need to be made into a quilt! I have a few jelly rolls nad plenty of scrap 2 1/2″ lengths. Would love this book! I have the beginnings of a strip collection. Love the quilts in this Big Book! I’m in the scads of scrap strip category with a few jelly rolls thrown in! I need this book!!! I have TONS of scrappy strips! Stacks of jelly rolls, and I also cut leftovers into strips for future quilts. This book would be awesome to have! I have scads of scrap strips and some jelly rolls. Help! I am all tangled up and need to get them sewn into quilts and out of the house! I will start stripping my stash, but I also have a bag of leftover binding stripes that I need to use. I have stacks of jelly rolls and leftover strips in a bin! I have lots of scrappy strips.This book looks great! I have both scraps and jelly rolls. This book looks great to use some of the jelly rolls and make space for new ones….. So many gorgeous quilts to make! I have ‘some’ jelly rolls, not a huge number but enough to get started. If I win this book, I’ll just have to buy a few more, won’t I? I have stacks of jelly rolls as well a lot of scrappy strips. This book looks like a winner for using up my strip stash. I need to make strips with my stash! Such beautiful quilts. I really should start stripping my stash. 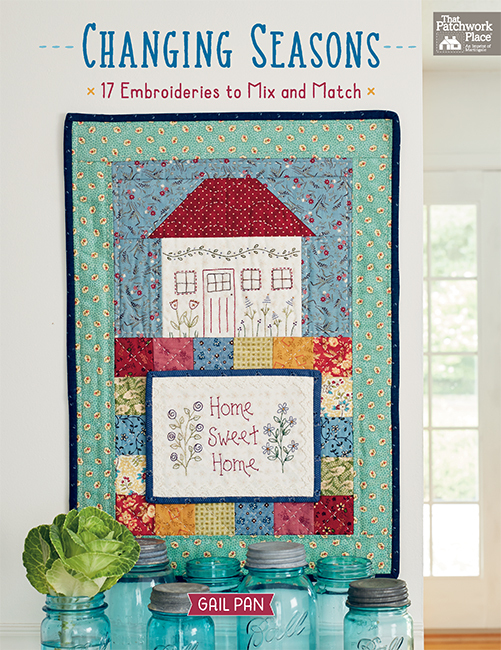 Love jelly roll quilts….this book looks full of wonderful ideas! I covet jelly rolls and plan to strip my stash! I’ve got stacks of jelly rolls and my own scrap strips. I have a collection of scad strips from 1″ to 3″ in width and various lengths as well as a couple jelly rolls. It’d be nice to have some new patterns to play with and make a scrap quilt. I have scads of scrappy strips and would love to use some of them in quilts from this book. I have lots of jelly rolls and scrappy strips. I need to use these so I can get more jelly rolls. right quilt – and it may just be in the Big Book ! I have several "Pops" as well as a few other strip sets that I have been holding onto until the perfect pattern appears. Looks like there may be a few choices for me in this book. I have several jelly rolls and two bins filled with 2 1/2 and 2 inch strips that I would just love some fresh ideas on how to use. This book looks like a must! I have a number of jelly rolls, lots of scraps and much more fabric in my future!! I have lots of scraps– many cut– others not cut. I sort my scraps by color. I would enjoy this book. 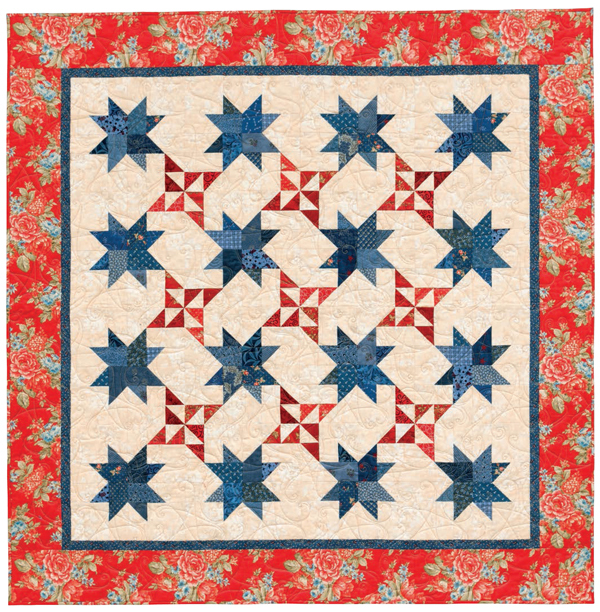 So many beautiful quilts, so little time…..BUT I sure would like to try all of them!!!!! Oh, what a wonderful book! I have all kinds of strips and squares and I see lots of ways to use them up!! Thanks for the chance to win this beautiful book! I own scads of scrappy strips. I would love to win this book! Thank you! I have mostly scrappy strips…and a jelly roll or two that I love so much that I am waiting to find the PERFECT project for! It is probably waiting for me in this book! 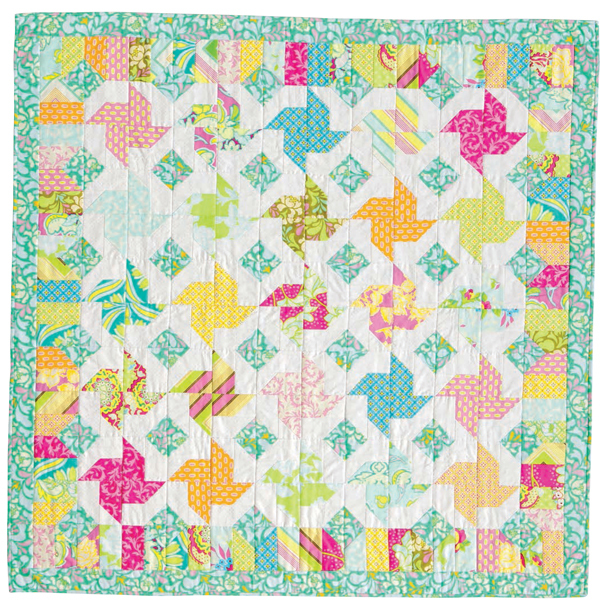 So many beautiful quilts and spittle time!!! BUT I should like to try and make each one…HA!!! I have a few jelly rolls and some scrappy strips. I also have plenty of yardage with strip potential! Scads of scrappy strips that are begging to made in a pattern from the new book. I have many jelly rolls. Need this book of blocks. The book looks fantastic to use up my many jelly rolls and stash of strips left over from many projects! I’m off to strip my stash! I definitely think it is time to start cutting strips from all the left overs I have. What a great book! I have stacks of jelly rolls! They are just waiting for a project. I definitely like the porch swing with the red, blue and cream. I want this book!! I have stacks of jelly rolls and a huge amount of leftover strips from completed projects!!! I’m a Scrapper (with a capital S!). Great way to use those leftover binding strips, border pieces, sashing…can’t bear to throw them away! I cut all of my leftovers from projects into my own strips so this book would provide lots of ideas. I need to make my scraps into strips. I’ve got one unused jelly roll and several of my own scrappy strips to be used in a planned scrappy quilt. I own just a few jelly rolls plus lots of stash to strip! I may have 1 or 2(wink) jelly rolls in my stash. Looks like a great book! I have stacks of strips cut from all the fabric patterns I have used along with a collection of jelly rolls. This book looks like the perfect solution for my stash!! I own a few beautiful jelly rolls and plenty of scrappy strips that are waiting to be made into quilts. I have a few jelly rolls but mostly I cut strips from my stash. Would love to get ideas to use up my fabric. Scrappier the better. Way too many scrappy strips! I need inspiration! I have some jelly rolls and also some scrappy strips. And stash I can cut from. I love making quilts from strips! I have stacks of Jelly Rolls. I cut my binding 2-1/2″ so all the leftovers go in a box for a some-day strip quilt. I love scrap quilts so of course I have lots of scrappy strips! But I also own some jelly rolls. All of the above, LOL! I have a few (OK, maybe a few more than a few) jelly rolls, and also a bunch of strips that I’ve cut from left over fabric from projects. This looks like a fantastic book! Jelly rolls, scraps and fabric—this book looks fabulous. I have all the materials….need the book and time…. My strips are of the scrappy variety. When I trim down a quilt or have a scrap strip I just toss them into separate bins according to color. Rolls & rolls – they’re just so pretty! It’s a tie between 1.5 and 2.5. Those are the two sizes I cut remnants down to for string quilts. Heck of a book!! I do have quite a few jelly rolls!! Thank you for the fabulous giveaway! I’m off to start stripping my stash! It could last a lifetime for me! I’ve got plenty of scrappy strips and plenty more scraps to strip. Well, let’s see…I have a TANGLED MESS of strips and am in great need of a book such as this! I’ve got both jelly rolls waiting to be used as well as yardage that can be stripped. I need this book!! This looks like a great resource! It sounds like it would be a useful addition to every quilter’s library. I have started stripping my own stash. Have only a few j.rolls because I prefer to cut 1″ strips. I have lots of scraps. Scads of scrappy strips! This book looks great! Thanks for the chance to win a copy. I started counting jelly rolls and stopped at 6! I looked at my stash and could "see" lots of possibilities. I love fabric and often buy it just to gaze upon it. Now its time to clear it away and make quilts!! Scrappy strips! I make my own. I don’t have any "ready made" strips right now. I have "LOTS" of fabric that I could make into strips. Amazing what you can do with little scraps of fabric! Well, I have two or three jelly rolls, plus and stack of cut strips! I’m ready to find a great pattern to use ’em up! I’m embarrassed to say I’ve never used a jelly roll just have scads of scrappy strips but with this book; I can see countless possibilities for getting started with jelly rolls too! All of the above should be another option. But I will start stripping my ever-growing stash to make more strips for the patterns in such a perfect book. What a wonderful way to destash my stash…..the patterns shown so far are beautiful! The butterfly one would be perfect for my granddaughter! Thank you for offering such a great book! I’m off to start stripping my stash! I love working with strips. Thanks for the chance to win. I need to start cutting strips from my stash. I better hurry up and prepare my stash for stripping. LOL. The quilts I make from this book would clear up my stash. Hey, that’s a good thing! Then I can buy more Fabric ie: precuts… Thank you for this Giveaway!! I have stacks of jelly rolls AND scads of strips. Love this book, so many ideas!! I have two jelly rolls I’m afraid to open AND Scads of scrappy strips! I don’t have any jelly rolls. I would have to start stripping my stash. The patterns are stunning. I have scads of scrappy strips that I cut from my yardage. Homemade jelly rolls just waiting for somw patterns. My scraps are not all cut in strips but it wouldn’t take long to turn them into strips!!! I have a wonderful stack or should I say huge stack of jelly rolls & Bali pops & more, plus a very, very big shoe box full of scrappy strips the same size. So this book could solve part of what do I do with them? I’ve got quite a few jelly rolls and lots of leftovers & scraps too. Love precuts! Stacks of jelly rolls just to pretty to open and lots of scraps to go with them! Thanks. I have stacks of jelly rolls and bags of coordinating strips. What a fantastic give away! I already have lots of srips from my stash and would love to try out some patterns on them!! Thank you!!! I cut strips as I go and as needed. Might require a little push to concentrate primarily on strip quilts. Scads of scrappy strips…I’m sure that I need MORE! I have lots of strips and also a couple of jelly rolls I haven’t found the perfect pattern for. I haven’t started stripping yet – but this book would be a great way to start! I’ve been working on my collection of jelly rolls and stash of strips (all sizes, colors, and type). I’ve just completed my third quilt (large lap); the first two were double bed size. Think the strips are multiplying in their container; I can’t seem to use them up! Would really like some new ideas. I have scads of scrappy strips just waiting to be made into something beautiful. I have some jelly roll strips and I could make lots more from my stash. Lots of jelly rolls and some scrap strips. I have some of everything! A few jellyrolls, a bunch of scrappy strip sets, and lots of fabric to cut my own. If only I could keep cutting them all straight it would be great! I have a few jelly rolls, scads of stash strips, and LOTS of yardage to make strips. need to strip my stash!! I have tons of scrappy strips and lots of jelly rolls. I have been stripping my stash and so I have tons of strips, with a special spot for 2-1/2″ strips. The Big Book of Strip Quilts is exactly what I need; just finding out that it exists is very exciting for me. I will definitely be an owner of this book, one way or another! Both Jelly Rolls and Scrappy Strips, so much to do so little time, outdoors chores are calling. scads of scrappy strips … a full bankers box….lol…..
Scads of scraps. I sew a lot, but not much quilting. I’ve been looking for the perfect project to launch me into quilting. I have both! More scrappy strips than jelly rolls, though. I am actually in the process of trying to get my stash under control and am stripping much of it! I have several jelly rolls just waiting for this book! I need this! I barely have any strips – just a few from past projects. Maybe I should start now! Knotted Squares is my favorite of those shown. I have some jelly rolls, lots of scrappy strips & a large stash from which I can make more. Scads of scrappy strips. This looks like a good way to use them all up. I have a short stack of jelly rolls. I have a few batik jelly rolls, and a couple of solid color ones, too. I love them because they make completing a quilt top so much faster! I have oodles of scrappy strips ranging from 1-1/2″ to 3-1/2″. This book is just what I need to start putting these strips to good use. And I know a few other quilts who would benefit too–not too early to do my Christmas shopping for them. A lot bigger stack of jelly rolls than my husband knows about!! Scads of strips and jelly rolls! I have a small stack of jelly rolls; but no patterns. Would love this book! I have jelly rolls, leftovers from jelly rolls, and leftovers from binding. And lots I can cut into strips. Thanks for the inspiration. I have several jelly rolls, made one jelly roll race quilt and didn’t like it at all, made a good charity quilt. But now afraid to open the rest. This book would be great to use up those 6 or 7 rolls I still have. My strips have been cut into 2.5 inches or greater (short and long) and squares and rectangles of various sizes. I also participate in an international group who make strip quilts for charity. We’re listed in Yahoo groups. OOOH I can use that book!! I have oodles of scraps — some are stripped and some I could strip. I also have a number of jelly rolls that I could not resist buying. I have several jelly rolls, mostly from Kate Spain collections. She’s my favorite designer. I’m looking for perfect strip patterns to show off her beautiful fabric designs! I’m getting pretty good at using charms, FQ and layer cakes, and want to expand my skills to using the jelly rolls. These are some of my favorite designers and it looks like a must-have book! Scads of scrappy strips — inherited from a quilting friend, who passed away recently. The blog pictures from this book are a wonderful group of creative and unique quilts. I have a lot of scrappy strips and a few jelly rolls in my stash. I have many jelly rolls in my collection. I have some of each and willing to make more from my stash. Hope I win! I have scads of scrappy strips. I have scads os scraps only s few of them strips so a few that need to be made into strips. Oh, there are way too many jelly rolls languishing around here! What an incredible book! I have stacks of jelly rolls I am saving for… And scads of scrappy strips! I just haven’t thought about this lately, this isn’t good, is it?! I have several jelly rolls waiting for the perfect project to come along, and I’m starting to cut scraps from projects into common usable cuts, including 2.5″ strips. This book would be a great place to use all of those. I have lots of jelly rolls, scraps to be stripped and boxes of cut strips! In other words I need to get sewing them and what great inspiration I saw in this great book. I have quite a few jelly rolls and a box full of strips that we use for strip quilts. I have stacks of jelly roll. This book looks great, would love to win it. Thank you for the opportunity. Stacks of jelly rolls and I really need to put them to good use with this book. I have a few jelly rolls and tons of scrap strips. I can see some great designs in this book that would use them–thanks for the chance to win a copy! I do have some jelly role strips and a lot of scrap strips so plenty of material to start on some quilts from the book. I have stacks of jelly rolls, and lots of strips I have cut from leftover fabric from other projects. Definitely have jelly rolls! And going to work on the scraps as well! Scads of strappy strips which keep multiplying. I have a few jelly rolls but boxes of strips of scraps from many projects! This book looks great! I could cut many strips from my stash, and I also have jelly roll strips. Scads of Scrappy strips. Thank you. I have tubs full of scrapy strips sorted by color. This wonderful book could help empty them out. There are so many great patterns to make I may never come out of my sewing room 😄 What a great way to loose weight! What a wonderful group of quilts. This book might keep me busy until my stash is gone! I’m off to start stripping my stash! I’ve not worked with jelly rolls at all (yet). Stacks of jelly rolls and scads of strips! With all the fat quarters I own it wouldn’t take me long to add number three–I’m off to start stripping my stash! Thanks for the giveaway!! I have a few jelly rolls and LOTS of scrappy strips…just need some ideas to go along with them! I have lots of jelly rolls and am always on the lookout for new patterns. It looks like lots of ideas for quilts. Love it. Oh !! What a wonderful way to use up your 2.5″ stash of strips. I have a small number of jelly rolls, but I have 5 collection containers that I strip my scraps into every time I work on a project. When a container is full, it’s time to make a quilt! I have stacks of Jelly Rolls. They are my favorite pre cuts! This book is a must have for me! I have scads of scrappy strips!! I usually cut my scraps to jelly roll size (or 2″, 3″, or 4″ squares) as soon as I finish a quilt! I have a few jelly rolls, but they are spoken for other projects for the most part. I cut any smaller leftover pieces of fabric into 2 1/2 inch strips though and do have them sorted by color!! I have a few jelly rolls in waiting; I’ve made a couple "JR" quilts and plan to do up the ones maturing on my shelf. I like the book because it shows lots of cute & fun options. I have both commercial jelly rolls and strips from my guilds exchanges. I have few jelly rolls. Waiting for the time to work on them. This book looks like a great source of ideas. Thanks. I have tons of strips and several jelly rolls waiting. I have jelly rolls waiting to be turned into something creative! I have many rolls and LOTS of scrappy strips. I need this book. I have scads of scrappy strips! I have a mix some jelly rolls and scads of scrappy strips. I have a few jelly rolls and lots of scrappy strips! I have lots of yardage and scrap strips to use. Thanks! I have several jelly rolls just waiting for this book and all the lovely patterns! I have TONS of jellyrolls! I just love them. I also have many colorful strips that I have so much fun using. All three of the above! I have lots of Jelly rolls! lots andlots of strippy strips! what a great book. stacks and stacks of jelly rolls!!! I have loads of jelly rolls and scraps that can easily be stripped! Wow! I love all of these quilts. I would love to win this because I have quite a few rolls to use up. Thanks so much. I have stacks of jelly rolls, scads of scraps, and I’m off to start stripping! I have jellies and scrap strips. Scads of scrappy strips and a few jelly rolls waiting for the right inspiration. Looks like this book would help me find that inspiration! I have stacks of jelly rolls plus I have scads of scrappy strips! I definitely could use this book!! Love love all my scraps…but need to get them worked up so I can store more! This book would help. I have fabric just waiting to be cut into 2.5″ strips! I have alot of jelly rolls that I have been hoarding. They are just to pretty to cut up. This book may change all that. I am definitely off to strip my stash-well, some of it anyway! So many beautiful guilts in one book. Thanks for the chance to win! I have jelly rolls I don’t know what to do with. What can I say…Love those jelly rolls. What can I say…love those jelly rolls! My Scraps are overtaking my Cutting Table. They are begging to be put into a Scrapalicious quilt!! I’ve got a few Jelly Rolls I need to do something with. I have several jelly rolls that I am always looking for a great pattern to highlight them! I have a large tote bucket filled with beautiful scrappy 2 1/2 inch strips! I have scads of scrappy strips.. and a few jelly rolls! I neeeeeeed this book. I have so many scraps I could make a house cozy. Really. I mean it. not joking, for real. Stacks of jelly rolls and tubs full of scraps. My 2.5 strips are mostly scrappy. I always cut a few strips from each batch of fabric and if I have leftovers I make charms. The jelly rolls I do have are batiks; I just love the different hues and just waiting for that "special" design Maybe I will find it in your book. What a great variety of quilts! I have stacks of jelly rolls and baskets of scraps just waiting for the right project! I have some stacks of jelly rolls! I have more than enough strips and I can’t wait to get my hands on this book! I love precut strips and have some waiting for me. After making 50 quilts in a year and a half, I’m taking a break, but this book is a treasure?!! I have only 2 jelly rolls. But looking at those beautiful quilts, I think it’s about time to make a quilt with them. I have one jelly roll. I generally just cut my own strips. Wow, this book must have me in mind. I am ALWAYS saving 2 1/2 strips. I have some jelly rolls, I have many strips from leftover yardage, and I should probably strip some stash! I love my stash of jelly rolls with lots of batik fabrics that would be perfect for the patterns in this book. I love Boxed In and Melissa Correys Irish Braid. Thanks for the chance to win the book ! I have jelly rolls waiting for this book! Lots of rolls and lots of stash strips….! I have 3 random jelly rolls I couldn’t resist, so this looks like an answer to "What will I do with these?". Not to mention that Stripology ruler I was coveting last week! I’m afraid to say that I don’t have much stash! But would love patterns for future jelly rolls I buy! I have a few jelly rolls, perfect for these quilts, thanks! I have a basket full of 2 1/2″ scrappy strips that I would really like to put to use. I have a few jelly rolls but mainly I have lots of strips leftover from ther quilts. I can always use new ideas on how to use them. All my strips are scrappy leftover bits from previous projects. Always looking for ideas to use them up. I have tons of scraps to use up! Gads of jell Rolls, but also lots of strings! I have a bit of both; I’d say I’m off to a good start. I have piles of jelly rolls! I love jelly rolls and have started cutting strips from my stash. I have a hard time thinking of ways to use them other than rail fence or jelly roll race. I seriously need this book… I have 4 jelly rolls and have no idea as to what to make!!!! Fingers crossed!!! I"m off to start stripping my stash! Oh my…I have SO many jelly rolls. I am a jelly roll addict. They just make me happy. I need this book!!! I have bunches of jellyrolls! I mostly have jelly roll strips, but save a thing that isn’t a crumb! The Big Book of Strip Quilts looks like a great source of inspiration. I’ll keep my fingers crossed and hope to get lucky!!! I have jelly roll strips and scrappy 2 ½" strips! I have lots of scraps in many sizes that I cut up for specific projects. I have a bunch of jelly rolls and scraps! I have scads of jelly rolls plus plenty of scrap strips! I have several jelly rolls. One is a Kaffee Fassett Batik that I know would make a lovely quilt from that book. Stacks of jelly rolls! And lots of scraps waiting to be stripped. Thanks for the chance to win. I’ve got some jelly rolls I’ve never used, but I’m going to start stripping my stash. Thank you for the giveaway!!! i have loads of strips as i cut any leftovers into 2 1/2 in strips for future quilts, tote bags and doll clothes. this book looks fabulous and inspirational. I have oodles of Jellyrolls and a bunch of self cut strips. Can’t wait to see the book. Fingers crossed…. I have a few jelly rolls and some scrappy strips. This wonderful giveaway would be perfect to get me started, and I thank you for the opportunity to win it! I have lots of jelly rolls and a large collection of 2 1/2″ strips cut from leftovers from quilts. I love the "Big Book" series. Thanks for compiling them. I have a few unopened jelly rolls that I would like to use to make a donated quilt for a needy girl. This book looks fabulous! Thank you for offering this giveaway. I mostly have scraps that would work great for the big book of strip quilts. I think I could get some new needed skills, too. I have both stacks and scads. 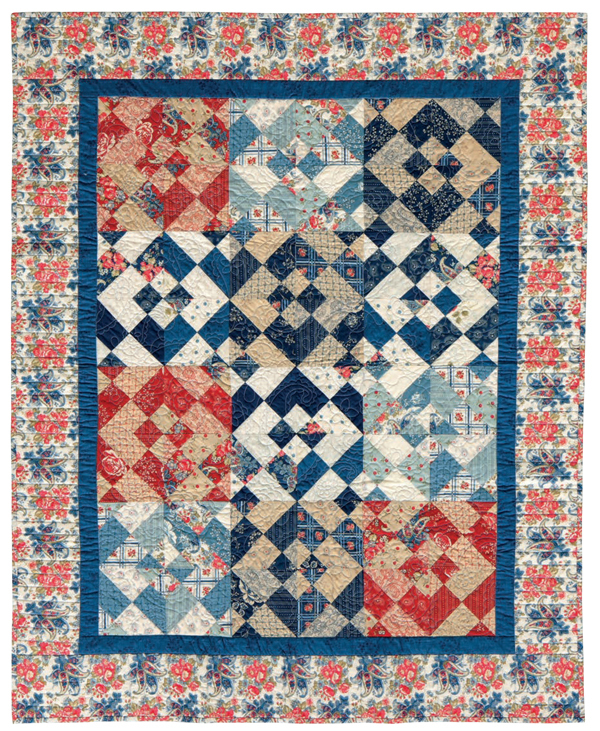 I keep coming back to this blog to look at the quilts again, and again. Scads of scrappy strips for me! I have scads of scrappy stips !! No jelly rolls here, but I’d buy a few if I’m the winner! I have jelly rolls and scrappy strips. I have all of the above. I need to get them used and I see lots of quilts I’d like to make if I had the book! I have lots of strips, in various widths! I’m ready to start using them! Thank you for this give-a-way opportunity!!! The big book of Strip Quilts is just what I need to cut down on the scrap piles. I’ve also got a jelly roll or two. This looks like a great book. I have a bunch of jellyrolls AND some stash that could use some stripping! I have a 5 jelly rolls that I`d love to get sewn up into some quilts! This book looks fabulous! All of the above! Part of my problem is putting them together. Looks like this could be great inspiration! Here’s hoping! I own a few of Jelly Rolls, this book will help me using these jelly rolls big time. I can cut many strips from my stash and I also have jelly roll strips. I have about 10 jelly rolls, but I cut strips from my stash every time I cut out for a quilt, so I’m building up my self-cut strip stash! Thanks for the give-away! I cut my scraps into 1.5″, 2″ and 2.5″. All containers are overflowing! I have bags of strips leftover from a string quilt. However, my handful of jelly rolls are best for this fabulous book! I’m a newbie so I only have a few jelly rolls. I have 4 jelly rolls that I need to see up! Thanks for offering the giveaway. I have stacks of jelly rolls! I would love to win the book! I’m a beginner so I only have one jelly roll but I am generating lots of scraps! Have a small collection of jelly rolls! Awesome book! I would love to win it. Thank you for the chance. I have scads of scrappy strips waiting to be used up. I have lots of jelly rolls in my stash and I would love to use them up. This book looks like it would be just the ticket. I have jelly rolls that I purchased and that I cut.I have given away sets aND watched my group make absolutely gorgeous quilts. I love the book and would lover to win a copy. Scars of scrappy strips-I cut my own. I love jelly rolls and have a ton of my own strips from my stash. I definitely prefer strip piecing to other methods and individual shapes. I’d love to put this book to use! I have scraps galore and need more quilt designs. This book would be perfect!! I am almost buried alive with jelly rolls. I have a very hard time resisting them. This sounds like the book for me. Thanks for the chance to win. Um…..all of the above! But mostly jelly rolls at the moment! I have one jelly roll, and stacks of strips that I’ve cut myself. But there could easily be more! Buckets and buckets of scrappy strips! I have stacks of Jelly Rolls that I am anxious to turn into quilts so this book would be very helpful. I have a small collection of jelly rolls and a stash of scrappy strips. This book looks like INSPIRATION that doesn’t quit! I have stacks of jelly rolls and scads of scrappy strips!!! I definitely need The Big Book of Strip Quilts. Thanks for the great giveaway. I mainly have jelly rolls strips. This book looks amazing and those quilts look so pretty. I have Scads and Scads and Scads of scrappy strips. The Big Book of Strip quilts looks like a great inspiration for all the jelly roll strips on my fabric shelves. I have stacks of jelly rolls, and the book looks like one I would use often. Some jelly rolls, some scrappy strips and lots of stash that could become strips…..I am ready for the book. I have a lot of jelly rolls. Jelly rolls…it will be wonderful to have a book packed with inspiration!!! I have several jelly rolls. Thanks for the opportunity to enter your drawing. I have scads of jelly rolls and tons of scraps to strip! I need this book! I am swimming in 2 1/2 inch scrappy strips. I have scads of scrappy strips. I keep them in plastic shoe boxes. I have never used jelly roll strips! I have lots of scrappy strips! This would be a perfect way to use them! 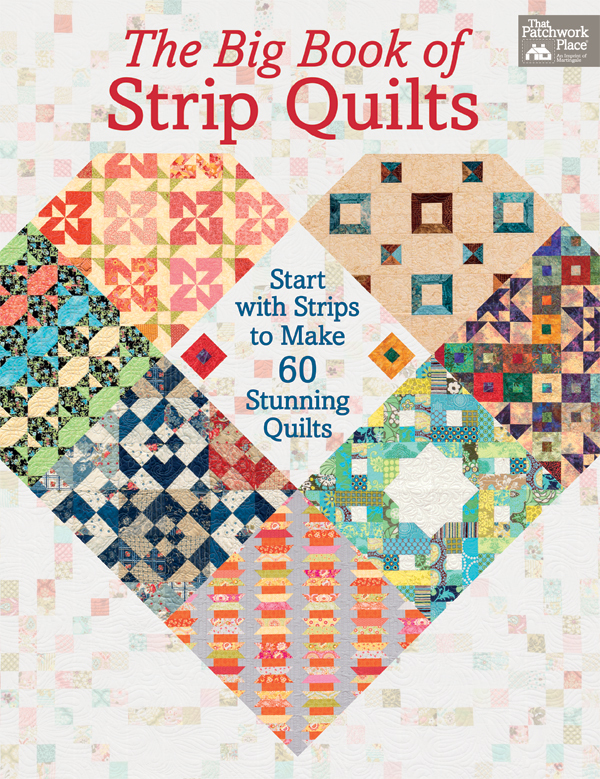 Wow….A fantastic source of inspiration.I mostly work with strips…And I’ve been quilting since 1986…When I took a class in Madison WI.As you may well figure I own tons of scrap strips.I love your book. I’m off to start stripping my stash. I ‘ve got stacks of jelly rolls that I just dont know what to do with….this book would solve my dilemma…how wonderful! fingers are crossed too! So many gorgeous quilts to make. 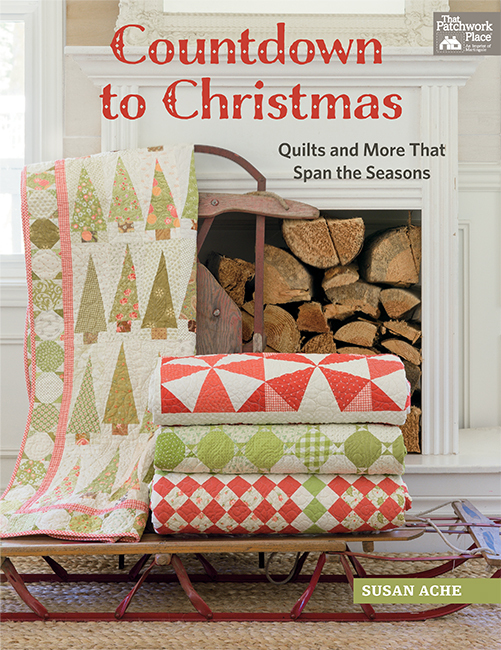 Win the free book or not, this book will be in my q quilting library. Thanks for the chance to receive the book. Mostly I have scrappy strips! I have a few jelly rolls that I find hard to use–but this book is going to help that problem! What a great resource to have, all in one place! Time to start strippin’! I have it all, jelly rolls, scrappy strips, and larger pieces waiting to be cut into strips what a neat book! Lots of jelly rolls and boxes of strips. I cut leftover fabric from recently-made quilts into strips – usually 2 1/2 or 1 1/2. I have both Jelly rolls and string stash, this book looks awesome and I would be tickled pink to win it!! I have a cache of jelly rolls. A tub of jelly rolls has been needing inspiration. I have jelly rolls and LOTS of scraps!!! I love the Martingale compilation books – great resource of patterns. I have scads of scrappy strips, just begging to be used! Scads of scrappy strips & a few jelly rolls. Jelly rolls are my weakness. I have scrap strips from leftover projects and purchased strips. They are fun. (Strips and/or Jelly Rolls) + this book = Quilt Tops. Finished projects = many smiles from gifted quilts! I have a couple of full jelly rolls, numerous leftover strips and many many scrappy strips. This would help "lighten" the load. There are not many strips in my stash but I have loads of lovely fabrics just waiting to be cut just the way I "need" them for the next project. So many great quilts in this book! The only challenge will be which one to do first! I have around 7 jelly rolls, lots of strips and partial strips plus lots of fabric to cut tons of strips. Lots of interesting quilts to be done with this book. I own some Jelly rolls, left over jelly rolls and strips I have made so I am off to try my hand at one of these beautiful idea pattern for a quilt. Now time where are you the outdoors chores are calling. You name it, I have it! Love, love this book! I really need that book. I am a collector and need that book to get started using some of my jelly rolls. This book looks like perfect inspiration to tear open those jelly rolls I’ve been hoarding. I have 40 years of scraps (strips, charms, layer cakes, etc) to use up — I’m trying very hard not to buy any more fabric for a while, to get through some of my stash and scraps. I would LOVE this book to get a lot of the scraps used up in lovely quilts….thanks for the opportunity to win! I have a plastic tub full of strips I have cut with my electric Go Cutter. I NEED this book! I have stacks of jelly rolls just waiting for the right pattern. This book looks like it would have quite a few. I own scads of strips! I’m looking for an inspiring pattern to use them up. Several jelly rolls and baskets of yardage to cut into strips – what a great book to have and use up my stash! I have stacks of jelly rolls and scads of scrappy strips!!!!!! I need this book. I have many jelly rolls (also many strips that I have made from left over materials) and always hard to pick out just the right pattern to use them. With this book I will have plenty of patterns to choose from. Thank you for giveaway. would love to own this book. My closet’s full of sweet jelly rolls! Stripping my stash, with pleasure. Just celebrated my mother’s 90th birthday by giving her a log cabin style quilt made from a jelly roll and honey bun! Guess I had better start stripping some of the stash. I have enjoyed using purchased jelly rolls, but obviously there is a lot more potential when you make your own. The book looks great. This book has inspired me to use up some of my strip stash and to start stripping some more! Very versatile patterns! Strip that stash here I come! SO MANY strip patterns in 1 book! I’ve got Stacks of Jelly Rolls. Would love some new strip ideas. I have a few jelly rolls and lots of scraps and stash that I’m off to strip! 🙂 I guess I fall into all 3 categories. 🙂 This book would be PERFECT for me! Everyone has said it for me. Lots of scrap material needing to be sewn. My stash has scrappy strips and a few jelly rolls just waiting to be put together! Thank you for the opportunity to win the pattern book!! I’m off to start stripping my stash! What a fun book. I strip my scraps so this would be a great book to have! I have scads of strips, a few jelly rolls, and leftover strips from some jelly rolls. Lots of pre-cuts and scraps to use up! Wonderful book! Stacks of Jelly Rolls and Scads of scrappy strips!!! Can’t pass up a good jelly roll sale and have been organizing my scraps for a year or so. Need some good patterns to clean it all out to make room for more!!! I have scrappy strips from past projects and fill in by stripping my very plentiful stash. Would love this book to start making a dent in what I have! I have Jelly rolls and LOTS of scrappy strips that are overflowing their containers. This looks like a book I need!!! I have jelly roll strips, leftover strips, and could cut more from my stash. Scads of scrappy strips and I have a few jelly rolls kicking around as well. I have boxes and bags of scraps waiting to be cut into usable pieces. I cut jelly roll strips, 5″ squares and 2″ X 4″ rectangles. What’s left is used in strip quilting. I have lots of strips and still cutting more. This book would be great lots of patterns I really like. I have a few jelly rolls, some scrappy strips (though I’ve tried to use those up lately in charity sewing), and I’m definitely game to strip my stash! Wouldn’t it be fun to combine all three? I certainly think so! I don’t have any jelly rolls but I got a stripology ruler for Christmas. So far I’ve just used it for bindings but this book would give me a lot of reasons to use it. I’ve got Scads of scrappy strips. Also have considerable collection that I could add! I have a few jelly rolls and lots of scrappy strips! I love scrappy quilts! Thx for the chance to win a great book. We must use our strips! Scads of scrappy strips! And a few jelly rolls. I’m off to start stripping my stash! Although I do have two rolls that came in a subscription quilt box. What a wonderfully comprehensive book. I have a few jelly rolls and have recently begun cutting scraps into strips. I’m off to start stripping my stash! Thanks for the chance to win! Several jelly rolls and lots of scrappy strips! Would love to start using them with this book!! I NEED this book to make more quilts for deserving warriors and veterans who have served our country! I absolutely love strip piecing! Well, I only have one jelly roll, but I have lots of strips cut. And I have scads of scraps that need to be cut into strips. I have stacks of jelly rolls, so this book is just right. Thank you for the give away. I have lots of strips and this book looks like it would be great for me. I have stacks of strips, leftovers from various projects. I have jelly rolls, rolls and rolls of them and I have no clue what to make! This book would definitely help. I have lots of scrappy strips. Scads of scrappy strips! I cut my leftovers down-to-size as I finish projects, so I have plenty of scrappy strips waiting to be made into a delightful project. A few purchased strip sets, but any time I am cutting, anything wider than 1″ goes into a strip basket for string blocks. Thanks for the give-away. Just got one jelly roll, but plenty of stash to strip! I have plenty of jelly rolls, almost all in red, white and blue so send that book my way, just love the Porch Swing by Kim Brackett! Don’t own a jelly roll, but I have stacks and stacks that I’m willing to slice up if I’m the winner !! I have both – Stacks of Jelly Rolls and Scads of scrappy strips. I started attacking my scrap bins, because I have more than one (doesn’t everyone?!!) I began by slashing pieces into strips and blocks then I rethought that and only cut strips now. I have a few jelly rolls and some scrappy strips. I may need to start cutting some more. 😉 Thanks for the giveaway!! I have plastic boxes full of scrap strips…I do keep the 2 1/2″ in its own box and pull some of my own that might match the jelly rolls I buy. I usually separate the colors of jelly rolls because I don’t like mixing that many colors and like to make quilts my own. And I have fun doing this. I have: a package of polka-dotted strips, unopened; the remains of 2 batik jelly rolls; leftover strips from finished projects; and a stash that could easily be cut into many more strips. I wouldn’t turn down an offer for more, and I’d love a book of projects for using them. Well… I mistakenly got into my wife’s email and saw this offer: Big book of Strip Quilts. I’m thinking I’d really like her to learn a little of this, so please pick my name so I can present her with a How-to book for her to …. Start Stripping …. some of those boxes and boxes of fabric arriving regularly at our house. Stacks of jellyrolls, and plenty of scraps that I could turn into jellyrolls. I have scads of scrappy strips. I’d love to get more jelly rolls as well. This book would give me such great ideas! Some are scrappy, some in rolls, all curated and ready to go. I could really use this book because I have scads and scads of 2.5″ strips just waiting to be put into quilts. It would make my life so much easier if someone else had the patterns worked out! Thanks for the chance to win this lifetime ideas for strips. I think I could do some real damage to my stash with this book! IT looks so wonderful. Thank you for the opportunity to win a copy of it. Lots of scrappy strips everywhere! Lots of jelly rolls . I have many jelly rolls, as well as 2.5″ strips from guild exchanges. Looks like a wonderful book! I have lots of strips leftover from other projects, so I think I would have a good start on some of these quilts. Thanks for the chance to win. I have lots of scrappy strips and way too many leftovers that could be cut into strips. I buy strip samplers from Connecting threads, and have boxes of them. I love Kim Diel’s quilts and have made several blocks from them. I also use the strip cutter ruler to "strip my stash" when I need a certain color or pattern. I haven’t used strips in quilting yet. Maybe a time to start. a few jelly rolls but need to start stripping my scraps and leftovers from other projects. This would give some inspiration ! It has to be a triple "S" threat….Stacked, Stripped and Stuffed in my Fabric Stash! I have a nice collection of jelly rolls plus some scrappy strips that need to be sewn into quilts. This new book looks terrific! I have stacks of jelly rolls just waiting for the right pattern. I think I found the answer in this book! I have a very healthy stash but no jelly rolls, maybe this book is the answer to this! I have oodles of scrap strings of 2.5″, and these looks like wonderful patterns to play around with! I’m not really off to start stripping my stash! So many strips are in my sewing room just waiting for this book to bring them to life! I have lots of precuts including several strip sets. I loved them and bought them, and now don’t know what to do with them! This new book would be a real bonanza for me! I have lots of precut she, including several strip sets. I loved them, and bought them, and now don’t know what to do with them! This new book would be a real bonanza for me! I have purchased a few 2-1/2″ strip bundles but mostly I just cut my own from my remnant stash. You know that we need to use up that stash….:-}. This book would be a big help using these up. I have jelly rolls, I have strips and I have lots of fabrics just crying to be cut into strips! This book would sure help for ideas to make a dent into all that lovely fabric! Stacks of jelly rolls & scads of strips! I cut strips from fabric and buy jelly rolls. I have a few jelly rolls but mostly I have lots of scrappy strips! Jelly rolls are one of my fav pre cuts. I can whip up a baby quilt in a jiffy with them. I try to keep a nice stash of them in different themes. Then I’m ready for any occassion! Thanks for this great book offer! Stacks of jelly rolls and MANY yards of fabric waiting to be used! I have a couple of jelly roll strips but I have scads of homemade strips just waiting for a scrappy strippy quilt. Thanks for the chance to win this wonderful book. Looks like an amazing book. I have lots of jellyrolls that could be put to good use! Thanks for a chance to win this treasure. I’m off to start stripping my stash! I have a bunch of random fabrics in my stash right now that I’d be happy to use in some of these quilts. I’ve got a stash of jelly rolls I’m apparently nervous to use. Jelly rolls abound in my sewing room! Great book! I have a tote of scraps with strips in there too. This book looks awesome, wow, love it! I guess I’m at the starting point. Got some scraps to cut up into quilts. And, I definitely drool at the jelly rolls. Time to get off my behind and join the craze. This book skows so many awesome design choices! Thank you for this give-away opportunity. Fantastic idea for my hoarded jelly rolls! Thanks! This would be the "pb" to my jelly(rolls)! I have lots of scraps but not many jelly rolls. I need this book. I have stacks of jelly rolls AND scrappy strips!! This book looks wonderful and is on my wish-list! Many jelly rolls and lots of strip sets! Whenever I’m sewing and cutting fabric, I always cut the leftovers into strips, then put them in clear shoe boxes with the width marked- 1 1/2″, 2″ and 2 1/2″. I would love to win this book! I have some jelly rolls but a box filled with scrap strips. I have stacks of jelly rolls that I want to make into something great. I have a stash of strips left over from other quilts. I have lots of jellyrolls that would love a purpose! Stacks of jelly rolls .. and I have to downsize .. the book would be perfect. I have way too many stacks of jelly rolls! I could really use this book. I have stacks of jelly roles! I have loads of scrappy strips. I use them a lot. I need to start stripping my stash. A few jelly rolls, lots of scraps, off to strip them!! Would love this book of ideas! I off to start stripping my stash. Beautiful quilts in this book. I have jelly rolls, and scads of scrap strips, in various sizes. Always looking for new scrap quilt ideas. Looks like I found some. I am new to quilting but have a large stash that i am very happy to start cutting into strips! I have scads of scrappy strips, well really a nice pile but not quite scads. Yet. I have purchased several jelly rolls, but have yet to open a single one. This book might be the motivation I need. Jelly rolls are hard for me to pass up! It’s so nice to have one in hand when I find a new quilt pattern that uses strips. I have several jelly rolls and would love to give them a meaningful purpose! Also have several scraps that would be a good complement as well! This looks like just what I was looking for!! I have jelly rolls strips. Scads of scrappy strips and some jelly rolls. I have a couple of jelly rolls and PLENTY of scraps that are waiting for the inspiration of this book! Upon surveying my quilting room I noticed one large basket of cut strips and several jelly rolls. I’m afraid to look in my hidie holes to find more such items. I would love to have this book in order to make a few of the quilts listed. I have flannelette strips I’d like to make into a soft, warm quilt for me. I have ltos of jelly rolls! I’ve got lots of strips in widths of 1.5″, 2.5″ and 3.5″. I have been looking for ideas to use my strips in some lovely quilts! I currently have just one Jelly Roll, alas. Scads of scrappy strips (4 bins)!